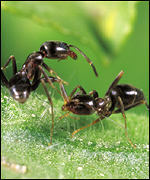 The Argentine ant is one of the most invasive species in the world. Normally a very aggressive insect, this ant has formed supercolonies in various parts of the world. A supercolony is a group of nests where individuals from different nests do not view each other as invaders and instead actually tolerate and aid each other. The definition of a supercolony as a "group of nests" is an unbelievable understatement. The largest of these supercolonies is in Southern Europe and stretches for over 6,000 kilometers! Another 600-mile long supercolony exists in California. And yet another 100km supercolony has been discovered under Melbourne Australia. And the Argentine ant is not the only ant that forms supercolonies. Apparently the yellow crazy ant (yes, that's the real name) has invaded the Christmas Islands and is forming supercolonies that are decimating the famous native migrating red crabs. Scientists "discover" these supercolonies by collecting ants from different areas and pitting the ants against each other in a miniature version of a gladiatorial arena. If the ants tolerate each other, they're exhibiting the same behavior as ants from the same colony; therefore, scientists classify the ants as belonging to a supercolony. At first, scientists speculated that supercolonies were largely due to a lack of genetic diversity; ants invade a new area with no predators and lots of food and spread like crazy, so all of the ants would share a common colony lineage. At least, that's the idea. As it turns out though, the ants do vary genetically. Scientists now speculate that when the ants invaded and found no competition, they lost the diversity in the genes that are involved in recognition and thus don't recognize each other as different. As someone who lives in the South, I pray fire ants don't learn this trick.